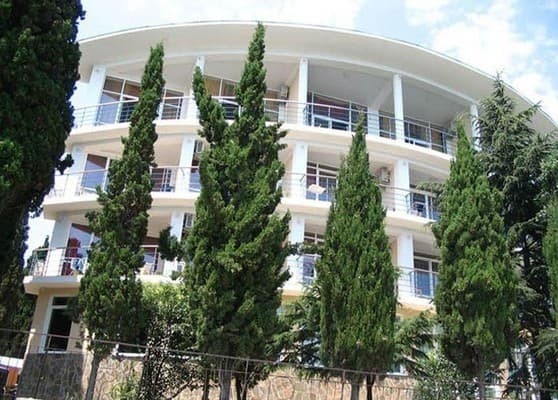 The hotel chain "Laskovy Bereg" is located in the resort area of Alushta, called the Professorial Corner. It is a quiet, picturesque, ecologically clean place, at the slope of Mount Kastel. 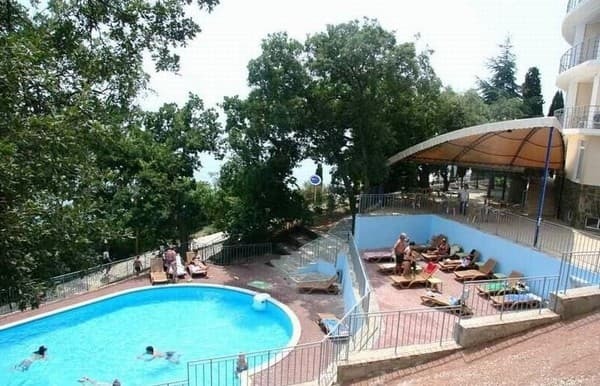 The hotel chain "Laskovy Bereg" unites a number of resort mini-hotels located 100 meters from the seashore, which have a common territory. 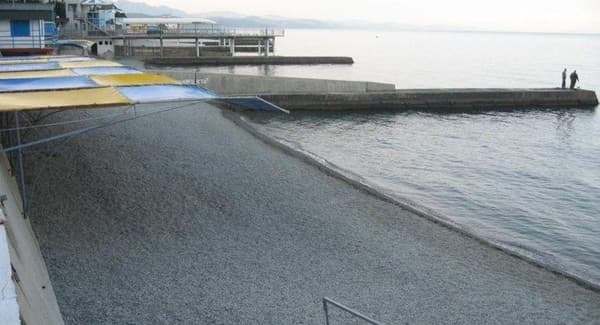 The hotel chain "Laskovy Bereg" has its own pebbly beach (shady awning, sun loungers). Nearby there is a summer cafe with a large selection of soft drinks, non-alcoholic cocktails, ice cream. Free Wi-Fi is available. PRICES MAY CHANGE, YOU NEED TO RECEIVE INFORMATION FROM THE OPERATOR! 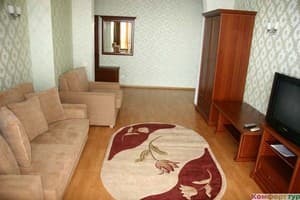 Description of the room: Room with a total area of ​​10-19 sq. 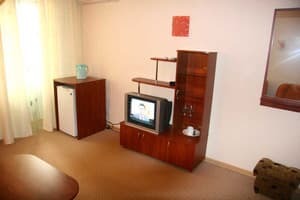 M. All rooms are equipped with standard furniture. Cold and hot water constantly. The cost of the room on the first floor is 300 UAH. 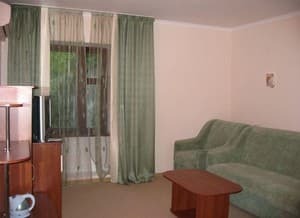 Description of the room: The room is equipped with new furniture (2 beds, a chair-bed, 2 bedside tables, a coffee table, an ottoman, a TV stand, a wardrobe, a mirror, a hanger). In some rooms there is one double bed. On the balconies are sets of summer furniture. 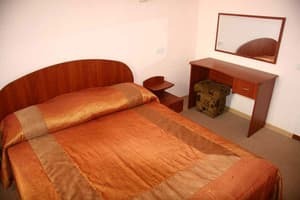 Description of the room: Number of the total area of ​​13.5 m2 with new furniture: one double bed, multi-function wardrobe, bedside table, coffee table, small sofa). Cold and hot water constantly. Description of the room: The rooms have new furniture (a sofa, two armchairs, a wardrobe, a wardrobe, 2 beds, 2 bedside tables, a coffee table, an ottoman, a TV stand, two mirrors, a dressing table, a hanger). On the balconies are sets of summer furniture. Description of the room: Room with new furniture (2 beds, chair-bed, 2 bedside tables, coffee table, ottoman, TV stand, wardrobe, mirror, hanger). In some rooms there is one double bed. On the balconies are sets of summer furniture. 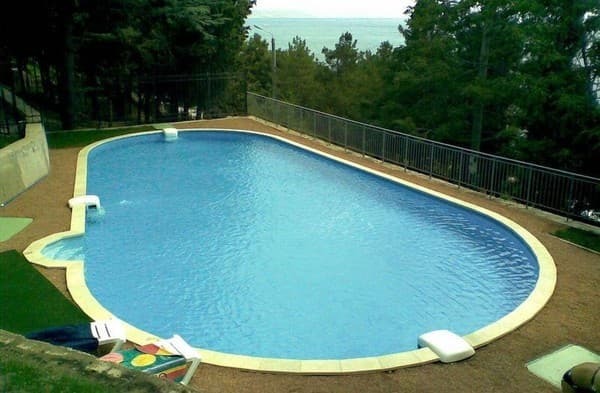 Description of the room: The room has a total area of ​​26.5 m2. In the room: one double bed, a multi-function wardrobe, two bedside tables, a TV stand, a coffee table, an armchair, a sofa. Cold and hot water constantly. 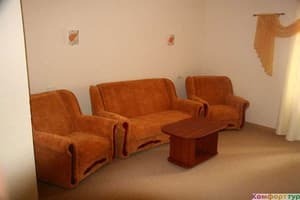 Description of the room: The total area of ​​the room is 32 m2. The rooms have new furniture (a sofa, two armchairs, a wardrobe, a wardrobe, 2 beds, 2 bedside tables, a coffee table, an ottoman, a TV stand, two mirrors, a dressing table, a hanger). On the balconies are sets of summer furniture. 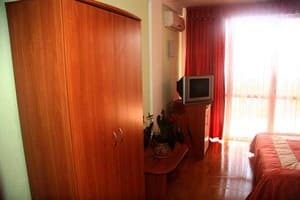 Description of the room: The room has a total area of ​​26.5 m2. The room has one double bed, a multi-function wardrobe, two bedside tables, a TV stand, a coffee table, an armchair, a sofa. Cold and hot water constantly. Children are accepted from 3 years. Compensation of public services (without extra space) is for children under 4 years old - 50.00 UAH, from 4 to 16 years old - 100.00 UAH, over 16 years old - 150.00 UAH. The hotel chain "Laskovy Bereg" is located in the resort area of ​​Alushta, called Professorsky Corner, 150 meters from the sea. From the railway station of Simferopol to Alushta by trolleybus No. 51 (the journey time is 1 hour 30 minutes) or by bus (journey time is 1 hour), then by trolley bus No. 2 or a fixed-route taxi to the bus stop. "Professor's Corner", then walk.